For nearly 70 years, Washington, D.C. was without a Memorial Day parade to honor our Armed Forces on this sacred day. In 2005, this changed. The American Veterans Center reinstated the tradition with the National Memorial Day Parade. USBA is proud to be a 4-year sponsor of this popular annual event. The parade route down Constitution Avenue attracts over 300,000 spectators, along with millions of TV viewers nationwide. It draws on the tradition of Memorial Day parades dating back to just after the Civil War. The parade’s mission is to call attention to the true meaning of Memorial Day – honoring our fallen heroes. This year, USBA partnered with the Armed Forces Benefits Network (AFBN) to sponsor the Heroes Sweepstakes for active military. 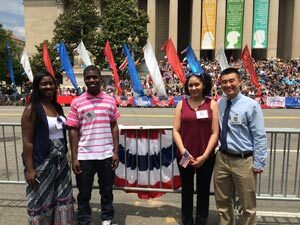 The Grand Prize was two exciting-trips-for-two to Washington D.C. with VIP seats at the viewing booth for the May 30th National Memorial Day Parade. This year’s sweepstakes winners were Annette Story and Paul Adamo, both U.S. Army. The 2016 parade saluted all active military and fallen heroes from the American Revolution through Afghanistan and Iraq. To all our country’s service members, we thank you for your service … every day.